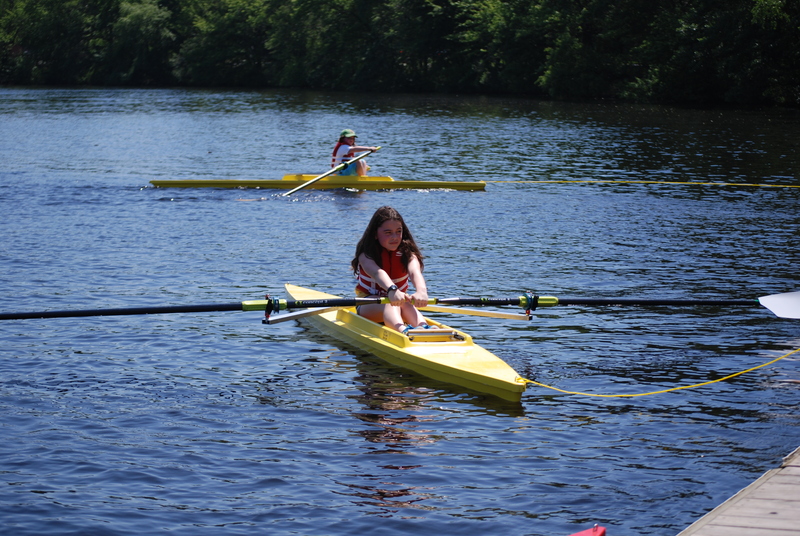 We think starting kids sculling, as early as possible, is the best way for them to learn to scull, a healthy lifelong sport, and/or later, to sweep row. We want kids to learn to scull early, develop their growing bodies symmetrically, and get a good feel for moving a single, before rowing any sweep boat (if ever). Now there is a sculling boat built to fit young kids. The Little Sculling Boat™. We have solved the equipment problem in teaching young kids to scull — that is, the problem of big boats and sculls. The Little Sculling Boat and Little Sculls fit younger kids, such that they can learn to scull comfortably, safely, develop good habits, and enjoy the sport. Europeans have been starting kids by sculling (rather than sweep rowing, as in the US) but usually in the early teens, some as early as 10. We think kids should start earlier in the US too, and, have fun with it. Now a kid can start as young as 4-5 yrs old. We hope with kids learning to scull first, there will be better sculling, more fun, more balanced muscles, and less injury. And, probably better sweep rowing, too. We hope our Little Sculling Boat™ will make it possible for thousands of kids to try and enjoy sculling. We want the sport to spread (through community rowing programs and summer camps, sculling camps, and as an affordable boat for households that have access to water), and the skills to improve exponentially. If you have ideas to help spread the word, the boats, the sport, please let us know. Kids sculling is already becoming more popular in the US. In 2013, the Head of the Quinobequin (the original name for the Charles River) the first US Head race for kids was held on the Charles River. 100 kids entered (age 11 to 18). The 2017 race had ca 200 entrants. (Grouped by age, 17-18, 15-16, 13-14, and 12 & under.) The distance is 2.5 miles, start at Cambridge Boat Club, finish at Community Rowing. In addition, the first race specifically using our boats was at the Head of the Fish in Saratoga, NY 2014. At the KinderSkiff Regatta, in Torino Italy, about 300 young scullers aged 11 – 14 race in singles over a 4 km course on the Po River. In the adult version, the SilverSkiff Regatta, more than 500 single scullers aged 15 and up will race over an 11 km course. I trained a 9yr old 2 years ago in an Alden. I ended up adding cement blocks to it to get the handel heigth right. Was hoping a shell scaled down in size was out there somewhere. Sculls too. Sculling should start even before they can ride a tricycle. I’m passing the word to clubs and fellow oarsmen in my area. Hope they catch on. 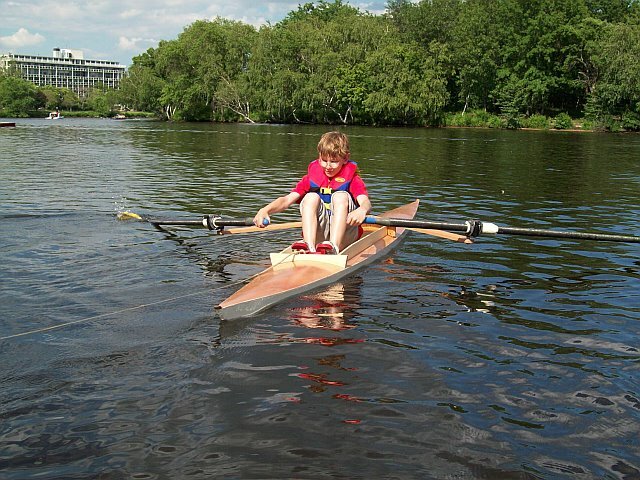 The 9yr old is now 11 and we needed a cox for an up coming race in Hull Mass ”The ice Beraker” this past November. She had no experience and the crew could only get together for one practice the Sunday before the race of the folowing Saturday. I made a detachable rudder for my double Alden Ocean Shell with the Oarmaster seat and rigger style. I rowed it in the bow and she sat in the stern on throwable PFD. As I rowed along I gave her a crash coarse in coxing as she got the feel of the rudder. We went on to take first place in the novice class. The other crews came over congratulate her on how good she was and asked how long had she been coxing. Since last Sunday she replied. They were so impressed by her and looking forward to racing against her again in March at the “Snow Row”. The crowd later at the award ceremony was also in awe at how young she was and gave great applause as she picked up the crews plaque. Great idea – provided they are not pushed into it . . . I can play catch with my little ones, go for a jog with them, shoot a few baskets… being able to go for a little row with them is great!